It occurs to me that Stokowski was 11 when Tchaikovsky died and possibly read the obit. Almost 60 years later he performed the 5th Symphony whilst on tour. The insert notes indicate this is a first CD release of these items. In fact the symphony was released in 1989 on the Frequenz label (041-011). That was coupled with a live David Oistrach performance of the violin concerto. For those who have a copy of that disc (and there are probably few since it was not available in the U.S. as far as I know) you have to replace it. The sound here is definitely better. It sounds like Archipel (who the hell are they? I can't find anything about them) had access to a tape one step closer to the original (they claim from the original source). There are more details. The bottom line is that this is a much more interesting recording to listen to. It passes the toe-tapping test whereas the Frequenz does not. It is amazing what a difference can be rendered by remastering. The early 50s were among his peripatetic years and these performances are from concerts when he was on tour. 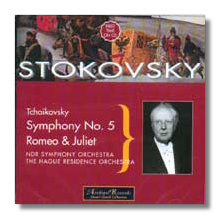 Both pieces feature Stokowski's tampering with the scores. In the 5th Symphony he dispenses with the pause before the finale. In the Roméo and Juliet he cuts the final crescendo. He claimed he made the change in the R&J because it should end sadly. Both alterations work well and I would not be surprised if Tchaikovsky would have approved. Both are also very intense, riveting performances. Stokowski changes gear at points as if he decided tempos needed geared up. That only adds to the excitement. Post Script: For some reason Archipel has taken to spelling The Maestro's name StokoVsky. That was not the case in their first release, Bach transcriptions with Stokowski Symphony Orchestra from the early 50s.